The golden age of ocean travel in the 20th century coincided with the rise of the illustrated poster. Shipping companies employed the greatest graphic designers of the day to visualise technological innovation and promote leisure, modernity and progress. 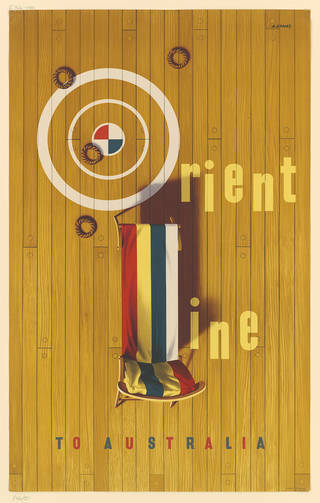 Enjoy this selection of iconic posters from our collection, charting 70 years of ocean travel. The rise of the poster began in the 1880s and 1890s, thanks in part to the simplification of colour lithographic printing. Early design trends were led by French masters of the medium, Jules Cheret, Toulouse-Lautrec, and Theophile Steinlen, and Czech artist Alphonse Mucha. In the early 20th century, with the extraordinary expansion in global manufacturing, entertainment, and travel possibilities for the masses, posters became the essential method of spreading a commercial message. Advertisers were driven to outdo their competition with ever more eye-catching, original, and appealing imagery. Shipping companies were quick to embrace progressive poster design. The 1910s saw fierce competition between the two German giants of shipping, the Hamburg-Amerika Lines and Norddeutscher Lloyd, and the two leading British companies, Cunard, and White Star Lines – with speeds hotly contested on the shipping routes from Europe to New York. 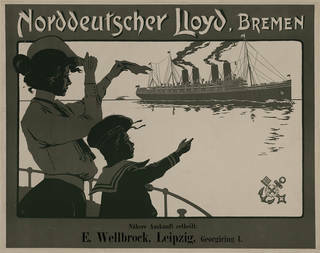 A classic poster from 1903 depicts the Norddeutscher Lloyd ship launched that year, SS Kaiser Wilhelm II, confidently setting sail, as if rising to the international challenge. The same ship was photographed four years later by Alfred Stieglitz (1864 – 1946), the pioneer of modern photography. 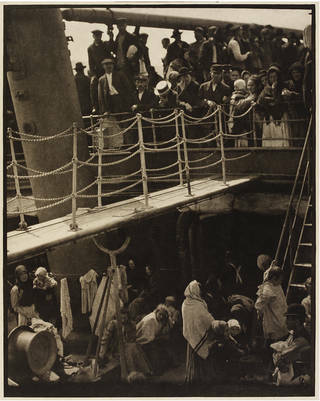 Titled The Steerage, his photograph shows third-class passengers travelling to Europe from America, possibly having been refused entry to settle in the States. He described them as "packed like cattle" in the ship's hold. Stieglitz' photograph shows the extent to which promotional posters successfully transformed a dangerous method of travel into a glamorous leisure experience in the public imagination. Spectacle and glamour would remain central to promoting the image of the ocean liner throughout the 1920s and 30s, though in reality the liners were serving the needs of a much broader public. 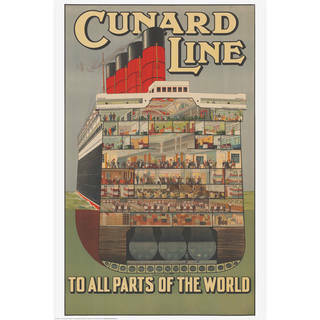 Cunard Line's poster 'To All Parts of the World' (about 1920) offered a complete cross-section view of the Aquitania, known as "Ship Beautiful". The Aquitania's luxurious interiors – a chief selling point – were designed by Arthur Joseph Davis. His business partner, Charles Mewès, decorated three of the Ritz Hotels, famous for their Edwardian opulence. 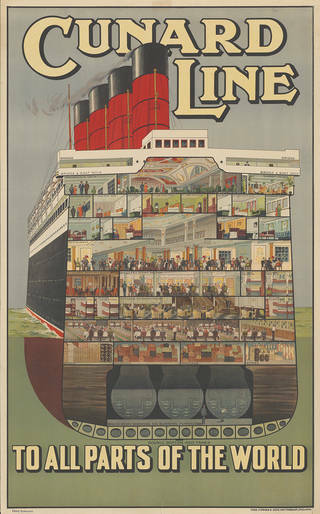 The cross-section reveals three classes of lounge, bedroom, dining and smoking rooms, alongside ample food stores, promenade decks, baggage rooms, and even the oil tanks. The cross-section device was common across promotional posters, brochures and ship models. Here it illustrates luxurious first-class areas (even the third-class accommodation appears spacious), conveys an awe-inspiring sense of scale, and presents a reassuringly ordered view of life on board, with designated spaces for daily activities. Art Deco style was at its peak in 1925, the year of the 'Exposition internationale des arts décoratifs et industriels modernes' in Paris. 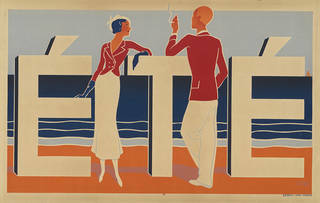 The French poster 'Été' (meaning summer), designed by the relatively unknown artist M.E. Caddy, is a wonderful example of breezy, leisurely Art Deco chic. Two fashionable pleasure-seekers lean against the giant white capital letters, reminiscent of a sea-front balustrade, or the railings of a ship's deck, with the jutting accents resembling the funnels overhead. Austin Cooper, a prolific poster artist who undertook many commissions for transport companies from 1922 to 1943, took a different approach with his jaunty, tongue-in-cheek 1928 poster for the Royal Mail Steam Packet Company. 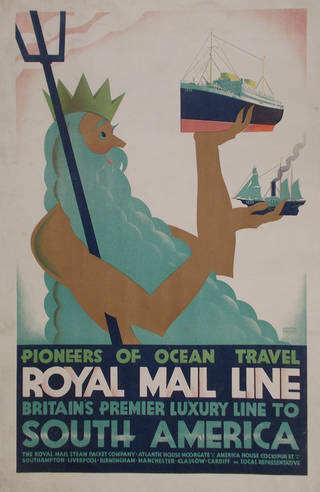 'Pioneers of Ocean Travel' shows the giant bearded figure of Neptune, armed with his trident, moving ocean liners and smaller ships around by hand without a sea in sight. 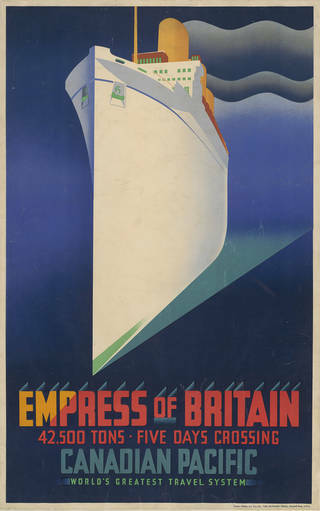 A classic Art Deco design was used to advertise the second of three ships called Empress of Britain (built in Scotland in 1905, 1930 and 1955 respectively). She was the fastest and most opulent of the passenger liners to travel between Canada and Europe in the 1930s, and was also the largest ship to be sunk during the Second World War, when struck by a German torpedo in 1940. Her image lives on in this striking modern treatment, featuring the majestic motif of a towering ship – a streamlined luxury behemoth. Other designs were more abstract. The pioneering graphic artist McKnight Kauffer had a knack for bringing everyday symbols to life. His clients included London Transport, American Airlines, and several British railway companies. 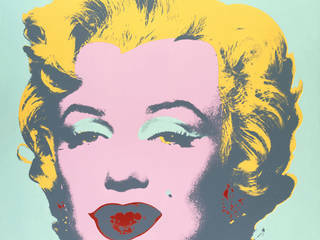 The V&A has over 500 original examples of his extensive design output. 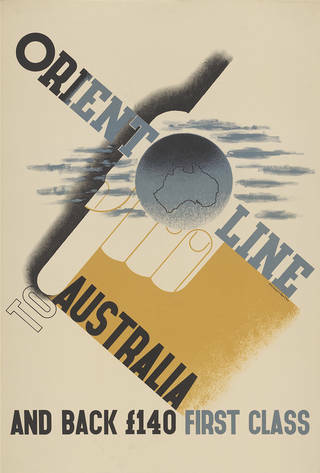 This design for the Orient Line to Australia makes effective use of a hand, scattered clouds and a globe. 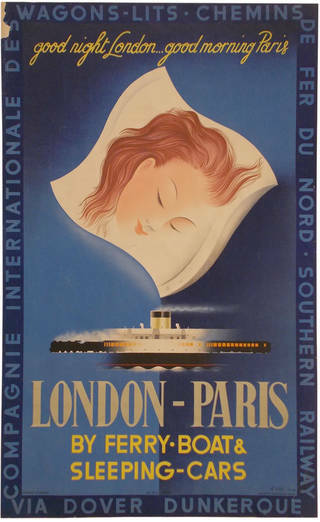 This poster advertises travelling from London to Paris by 'Sleeping Car and Ferry Boat'. The sleeping cars were made by the Compagnie Internationale des Wagon-lits, whose exquisite trains included the Orient Express and the Blue Train, names still synonymous with the pinnacle of luxury travel. 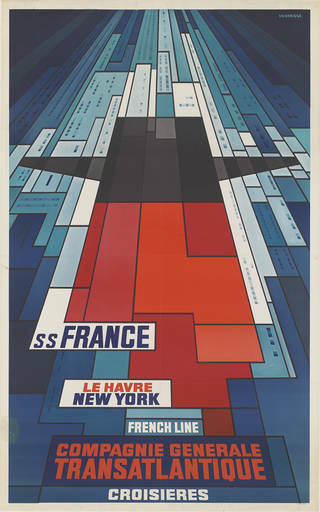 The poster celebrates the establishment of the Night Ferry in 1936 – the only non-stop train between London and Paris until the opening of the Channel Tunnel in 1994. The sleeping cars were loaded onto the ferry so the guests did not have to be disturbed en route. In the 1940s, Abram Games' career rapidly took off thanks to his hugely successful safety and recruitment posters for the War Office. Post-war, he created the celebrated advertisements for the 1951 Festival of Britain, including the 'Festival Star' logo, and collaborated with a wealth of private clients including Guinness, British Airways, and the Orient Steam Navigation Company, who later merged with P&O. This bird's-eye view design cleverly incorporates a game of rope quoits for the letter O and a deck-chair for the L, referencing two popular deck activities. The longest ocean liner ever built at the time of its construction in 1960, the SS France was the showpiece of the French fleet, following the glorious Normandie, launched in 1932. John Bainbridge's 1960s poster harks back to the bold graphic treatments of the early 20th century, referencing the creative artistry of A.M. Cassandre's iconic Normandie poster from 30 years earlier. Selected posters can be seen by request in our Prints and Drawings Study Room. 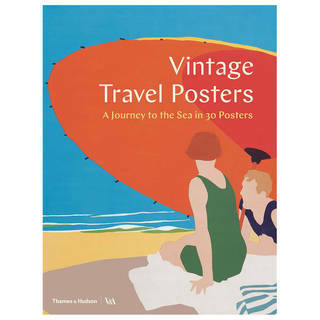 Packed with charm and style, this book includes 30 fully detachable full-page posters to transport you back to the sun, sea and sand. An exclusive V&A print. 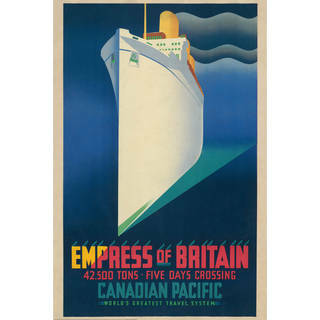 Empress of Britain poster for Canadian Pacific Railways. An exclusive V&A print. Cunard Line – 'To all parts of the world'.